I tried to use all water colour in this picture, with only a few ink lines to sketch the figures. The sea is so hard to paint, all those waves that just won’t sit still for me to draw, and people are always a challenge. I didn’t really succeed with the water colour and when I got home it felt very insipid so I got out the colour pencils and gently added some depth to the colours. I only have a limited water colour set and just couldn’t get the colours I wanted, and working with such a new technique on site defeated me this time. 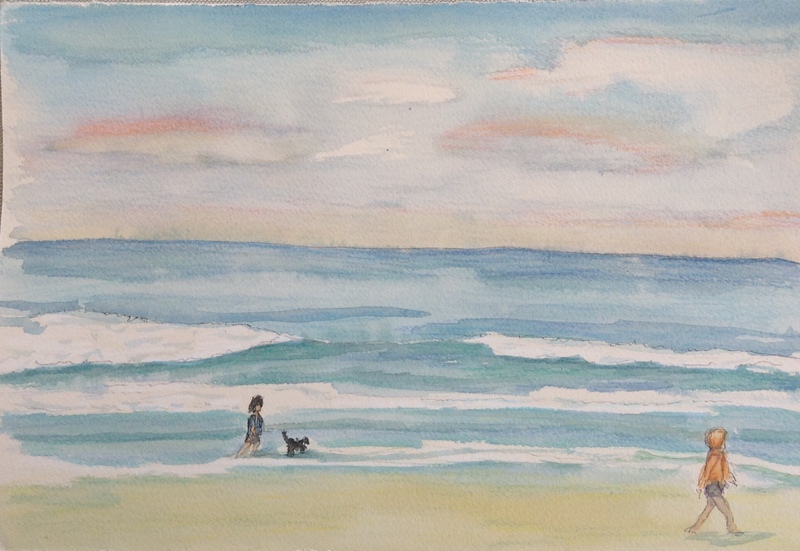 I did this drawing at the beach, there were loads of people walking, many with their dogs. It made me miss mine, I will never get used to going for a walk without a dog, it just seems wrong somehow. 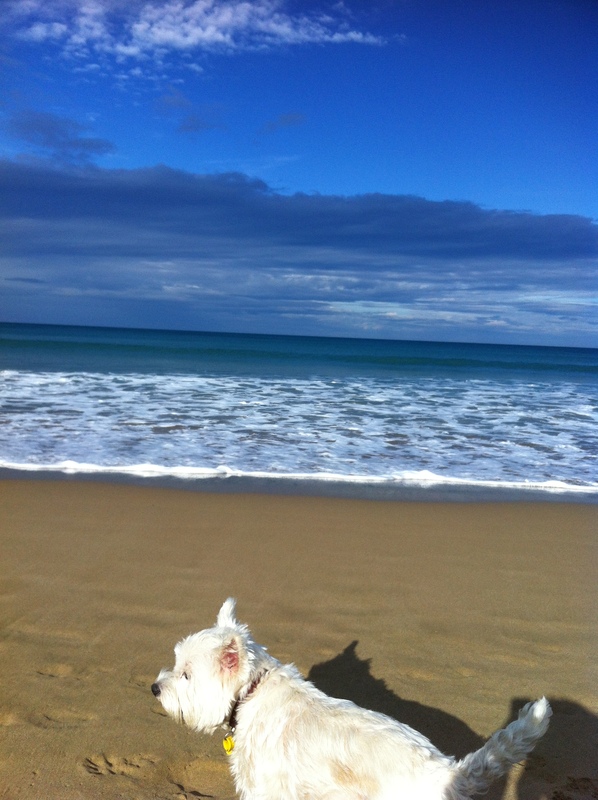 These dogs were having a fabulous time chasing waves and each other. This view was taken looking straight ahead, I also took photos looking either way up the beach and when I got home I used the one looking left for another painting. 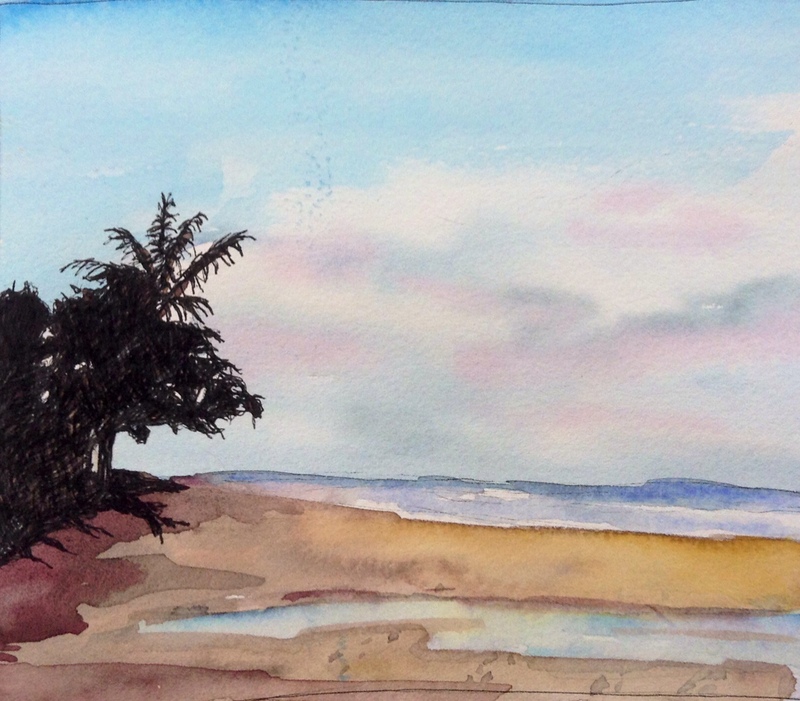 I used ink for the trees, but it tried again with the water colours in a more controlled environment and I am much happier with the result, especially the sky. Nothing beats water colours for painting beautiful skies. A bit more practice and I will get consistent results. 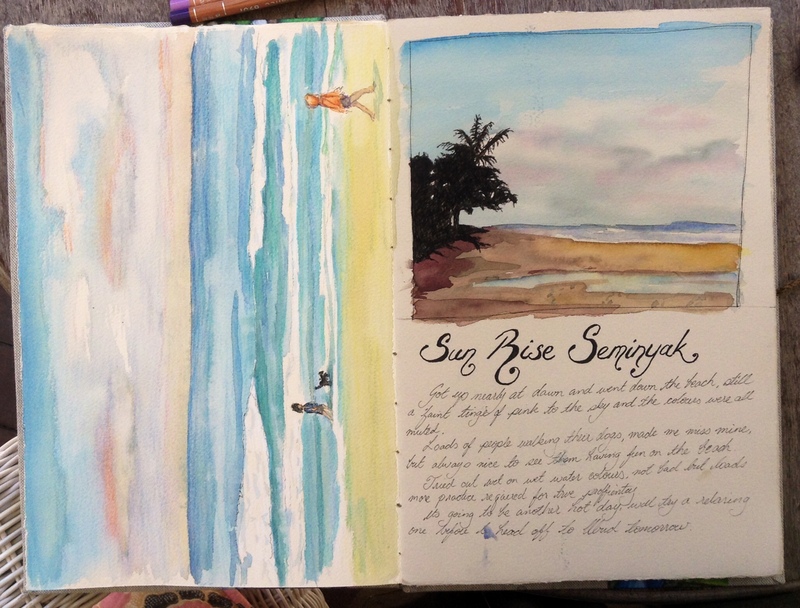 Here is the journal spread, starting to get the writing to work with the drawings. I am off to Ubud for the day tomorrow, looking forward to seeing the inland scenery and the rice fields and of course all the arts there. 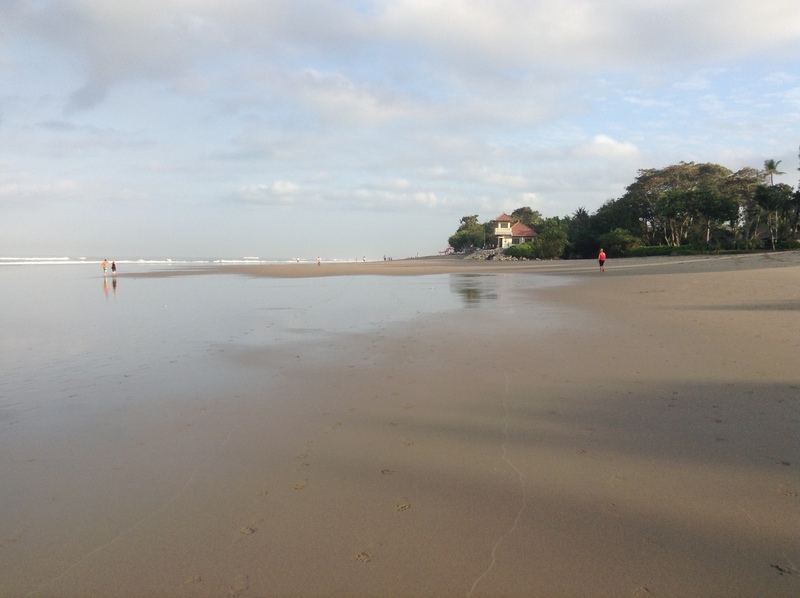 Ubud is the artistic centre of Bali and has many fine wood, silver, fiber artisans and fine arts. Hope I can find some nice things to take home. I have to admit that the postcards have slowed down as the art work has increased. I may be turning from the occasional artist to the obsessed artist, but I have squeezed this postcard in. Topic Kate in Poland prefered postcards that showed views of the country that they came from. Wasn’t sure to do an Australian scene or something more local. 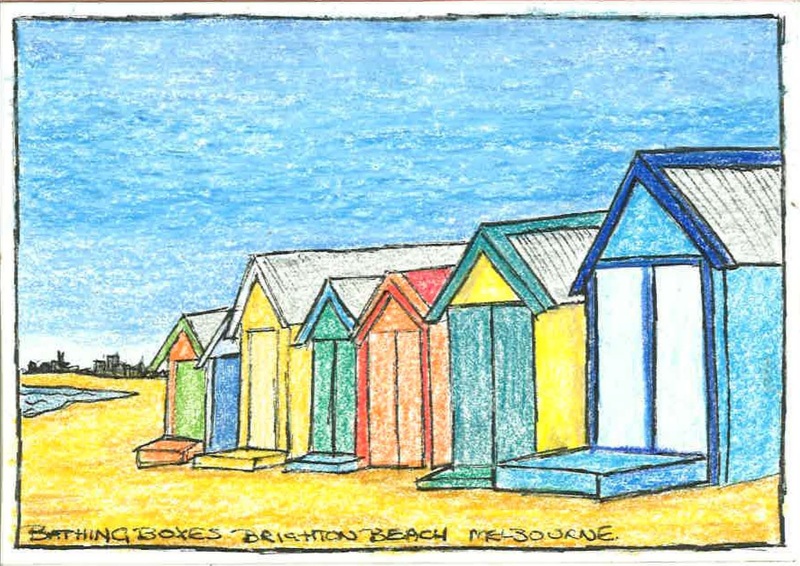 Since we have finally had our usual lovely autumn weather of warm still days with cool evenings and we have all been outdoors lapping up the last of summer, I decided to do a drawing of our local beach and the iconic bathing boxes there. When researching the image I came across photos that showed the city center in the background. That is such a typical view of Port Phillip Bay on which Melbourne is situated and the greater city of Melbourne wraps itself right around the bay and you get great views back over the water to the city. Decided to keep it colourful and simple, coloured pencils again, but by themselves to give the colours the washed out look you get under our harsh Australian sun. Fairly happy with the outcome, pretty much got the perspective right, had a couple of revamps of the sky, but it has the feel I wanted and love the composition. Hope Kate likes it and now back to the art work, Grevillea coming along well.